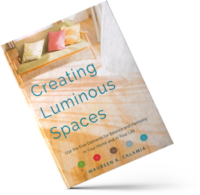 Maureen's book, Creating Luminous Spaces is out! See what experts are saying about it! Dr. Julie Krull Show - All Things Connected (June 2018) - Creating Luminous Spaces with the Wisdom of Nature with Maureen K. Calamia. Maureen talks about Romance & Feng Shui on "Date Night with Connie & Chrissy"
Maureen on News12's Long Island Naturally on "Staging Your Bedroom for Romance with Feng Shui"
Regular contributor to mindbodygreen and elephantjournal.com. "Why Plants Make Us Feel Good"
"What the City Could be Doing to a Child's Psyche"
"Feng Shui is More Relevant Today than Ever Before"
"Feng Shui: A Tangible Path for Earth Consciousness"
Interested in having Maureen speak at your conference, radio or TV show, or business meeting? Creating Luminous Spaces: How to Discover & Support Your True Nature? Feng Shui & Real Estate: How to Buy or Sell with Success! Any other topics you'd like to suggest? Romance, Prosperity, etc? Contact us for a press kit or more information.